A large influence on sales of automobiles is its classification in insurance rate categories. In order to classify an automobile in an inexpensive rate category, the automobile must fulfill certain criteria. One such criterion is the scope of damage, which would occur in case of a rear impact. 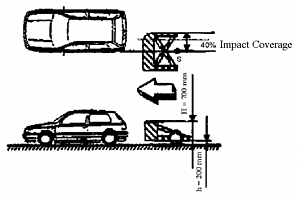 The quality criterion for the rear bumper is defined by the scope of damage due to an impact covering 40% of the rear bumper (top figure). The kinetic energy is transferred completely into strain energy during impact. In order to minimize strain paths on one hand and to avoid an overstrain of the spar on the other hand, the energy over the strain path should increase as quickly as possible to approximately 80 [kN] and should be held at this value until deformation stops. Also, the bumper should deform in a translatory manner, in order to avoid additional damages due to tilting of the bumper profile. The design illustrated in the center figure does not fulfill these requirements. The deformation element buckles to one side at a strain of 40 [mm]. 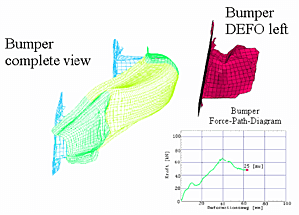 As a result, the force substantially decreases and the top bumper edge hits the rear end of the automobile. The illustrated results of the crash simulation (PAM CRASH) correspond with the results determined during an experimental crash test. 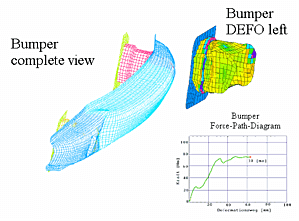 Taking these results into consideration, a deformation element was designed to meet the requirements (bottom figure). As a result, buckling of the bumper can be completely avoided. Beginning at 30 [mm], the deformation forces remain almost constant at a value of approximately 78 [kN]. According to the inner high pressure method (IHV), a pipe serves as the deformation element. The pipe is pressed together at impact absorbing the entire shock energy.